Agile is a free, open source, management platform for startups and agile developers. Pros: The Kanban board is my favorite feature for tracking feature development status. The progress bar of what has been completed on the Kanban page is very nice as a progress indicator when informing clients of progress on certain features. The custom fields have been convenient for billing purposes and the ease of use when moving tickets around is nice and fun to do. Cons: The issues board often ends up with a lot of smaller features that can be categorized as "Enhancements" but it's still confusing that their under the Issues umbrella and even their URL's say issue. A way to have enhancements that don't qualify for a full story, but are not an actual issue/bug should be categorized in a different why, or at least represented differently. Overall: Team productivity and management has been simplified. 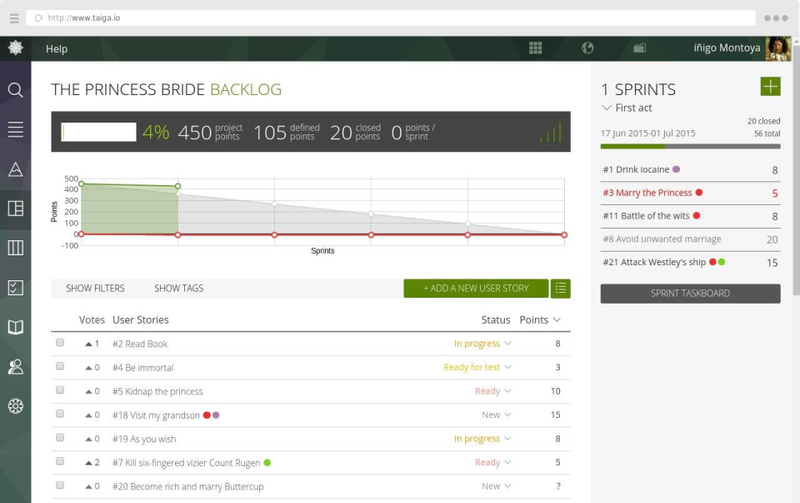 Progress tracking and reporting has become easier when we break down tasks to the bare bones. The Slack and GitLab integrations have been nice for modifying tickets from commits and merges. Pros: Very easy to use with drag and drop functionality. Cons: Would like the ability to drag multiple items on the backlog, not just the Kanban. Pros: When JIRA didn't meet our needs, we analyzed every tool on the market and decided on Taiga due to it having the lowest number of clicks per action in our workflow. Its easy to get started with, the search features are fantastic, and it scales well from tiny projects to monsters. Cons: We use almost exclusively the issue tracker because of it is the most flexible and has the best searching/ordering of the Taiga views. However, issues can't be owned by user stories or epics, which limits our ability to organize large projects. I wish issues could be used as children of larger scope items like epics. Pros: What I like most about software taiga is that it allows me to organize the tasks of my projects well and have control of them, since the programmer must indicate when a task is in progress or when the task is finished, besides allowing us to know the Development time of each one. It is also super useful because you can add the client and the same can see how the development of your project is and follow up. Cons: Although I really like Taiga and I use it in all my projects, it would be interesting to have a mobile application, in which to have a summary of each project and be able to have the status without a computer necessarily. Overall: This tool has allowed me to organize, control and follow each of the assigned tasks for the execution of all my projects. Pros: Love the kanban display. Out of the 50+ products I've used, the kanban view of Taiga is my favorite hands down! And I love the way your sub tasks/stories work. Overall: Easy adoption, allows us to view project priorities in the nice high-level overview of the kanban as well as break down stories in more detail using subtasks and epics. Pros: Visually it's the best of what I've seen. So many project management applications look terrible, so Taiga is refreshing in that aspect. Cons: I was never able to actually convince a workplace to switch to Taiga because it lacks the level of customization that some other project management tools have. I don't use it personally because Gitlab has such nice project management tools built in and I love having everything in one system. Taiga seems to be positioned in between the simple but integrated tools of Gitlab and the complex/ugly interfaces of Redmine. Being placed in the middle makes it not a great fit for any particular project. Pros: It's made by developers for developers. Very well thought and made. The philosophy is very comprehensible. And more, with a great U/X skill. Cons: The price who exploded this year ! Considering the size of our team, we can't follow ! However, there could be only a little change that make us happy and still paying : don't make us pay inactive users (and handle the feature of inactive users of course)! Overall: A great Agile organisation helper. Pros: It is really easy to use, everyone has boarded really quickly with it. We were previously using lots of different tools from Google Spreadsheet to JIRA. Taiga is much simpler to use. I don't see any other tool that would match our requirements. Cons: User Interface feels a bit old: it might be a bit shinier. We've also tried to install the Open Source version on our server using Docker but the documentation was pretty poor at the time. Finally, we've decided to use the hosted version and we are really happy with it: it is not really expensive. Overall: Much much easier to use than Jira. Pros: 1. Team board inspire the employees to achieve their targets. Cons: 1. Its feel like screens are more complicated. For a user it will take time to adopt with the system & mange them. Overall: It help us to mange our projects & practice the agile process. This is a very good tool to use for an software company. Pros: -- KANBAN board helps to manage & measure the project status. Cons: -- Its little bit confusing working with different kinds of screens. Overall: We are able to manage both project management & issue tracking using this application. So we no needed to have multiple applications. Pros: Taiga is simple to use, and easy for nearly anyone, even non-technical helpdesk and clients can use it and understand what they are doing. Cons: A big reason we chose Taiga was their pricing model, a flat rate for 25 users. That model changed recently to a per-user per month basis. We need multiple accounts for external clients as well as internal users and this pricing model makes it too expensive for a small company. We are/were grandfathered in for the duration of our contract, which when it expires, we will move away from Taiga. The tool is seamless, lightweight; my team finds it very intuitive and easy to use. Pros: Lightweight and user experience makes the software standout from it's competition. Although we have not used the API and the integration capabilities, we are excited for the possibilities that exist for making the product handshake with the other tools that we use internally. Cons: We'd like to see the tool evolve and become more customizable so the end-users have more control towards configuring the dashboard and the elements they maybe interested in. Another area where the tool can be better is reporting and metrics. Support for basic scrum/agile reporting metrics (burndown chart, etc.) can help teams. Pros: The implementation of agile concepts are done really well, Helps us manage our project cost and resource bandwidth easily. Overall: Managing project milestones, cost and resource planning at ease. Pros: 1. The current plan of 5 projects without restriction on the number of users for a fixed monthly price was good for us. Cons: 1. I got an email recently that the current plan will not be offered next year. We will be charged per user. We may look at other options. 2. No integration with TFS. Pros: The ease to follow a project. To have insights on the works of your team. All project information in one spot. Cons: The software is not mobile ready. There is no app. You can also not create templates to create new projects. Pros: Taiga is very flexible in terms of ptoject management . It provides kanban and scrum templates. Task management is really easy. Project velocity can be tracked easily. Issue management is handled nicely. Cons: The UI sometimes gets distorted on some resolutions. Overall: Our organisation have been using taiga from ptoject management. It has been a great experience. You can manage your tasks and project velocity effectively. Taiga is very easy to use and to customize to our needs. Pros: The customization because we don't follow a production pipeline that fits perfectly in one management theory. We combine different management theory to fit our needs and this is possible with Taiga. We also really like the cheap price. Cons: We didn't had the occasion to use it deeper because we are between projects. But we think that it would be nice to track more the time users pass on some tasks and have a tool for customizable timesheets. Overall: An easy way to create and follow tasks in Kanban and Agile. A customizable product, easy to use and not expansive. We've been using Taiga for about 14 months to track software and content projects. Pros: It's very flexible and lets us adapt the Kanbans to our needs for each team. The reports generated are good. Cons: It has connectivity issues at times. Perhaps needs an infrastructure upgrade. Cannot bulk remove or delete items from the backlog. Overall: We were able to organise projects for about 40 people on several teams without having to spend what something like JIRA costs. Pros: Tiaga is easy to set up, has the core product management features you need, and offers multiple strategies out of the box. There are also easy ways to manage open source projects, including tools to find volunteers and share product plans. Overall, the functionality is what you expect for a basic project management tool. Cons: Taiga lacks the advanced and comfort features that make the job easy. This includes easy Kanban-style ticketing view, full customization, higher level project management (epics), and a fair pricepoint. While you can host Taiga yourself and add this customization, as it is open sourced, few will have the time or patience to do this. These issues do not make Taiga impossible to use or recommend, but will frustrate users of JIRA or Pivotal. Overall: Project management, product management, issue tracking. Best project management software out there. Pros: It's a great project management tool and easily better than the other solutions we use with other clients (pivotal tracker, forecast, gitlab and trello). Cons: Needs better mobile support and does not have time tracking and budget tracking features. Needs better sprint creation/edit too. Pros: The learning curve is minimal and greatly facilitates the use of non-technical profiles. On the other side, its powerful api and the webhooks have allowed us to automate some processes. Pros: Great replacement for Trello. Much easier to use than Atlassian. Useful kanban board. Can add lots of tags. Cons: Cant estimate user stories in hours and measure progress. 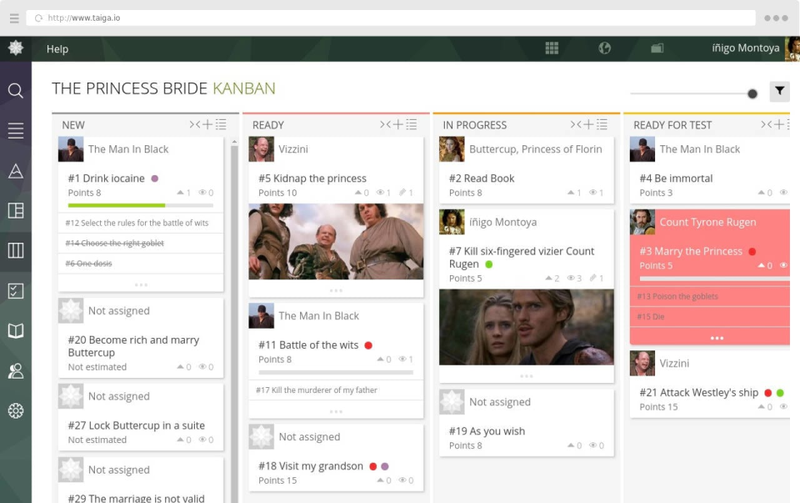 Also would be great to see issues on the same kanban board as user stories. A good product for the price given. Pros: We chose Taiga over other similar available products because of the price and its simplicity. Its good for tracking progress of development, issues and options for adding custom user inputs. Integrations with other platforms is a plus. Cons: Easy (simple) reporting for management (weekly, monthly) would be a nice-to-have function. Sometimes the website works a bit slow. Wiki pages could work a bit better. Automatic reminder for issues that were not updated (touched by anyone) in some period would be good to have as well. Overall: Finally a product with which the management was happy (attractive price). People (developers) finally started to use ONE product for keeping track of development of different products & projects and things are now handled in Taiga instead in txt files, SVN commit comments etc. Its easier to keep track of the development status of a product - but every member of team must use Taiga regularly - which was the hardest part to agree on. Cons: should be better with an api for Zendesk, plus the point could be most customizable. Pros: Taiga is free, you can deploy it to your own servers. It's easy to use, you can customize Taiga easily. It's getting active development, and developers keep adding more and more features on every release. Cons: Packing of the software isn't good on self-hosted version. You will definitely need a system administrator both to setup and upgrade the Taiga. Pros: Task Board : We can create task and move them as per steps in development cycle. It was easy to use in teams. Awesome experience. Pros: I like the visual way they display information. Easy to see status of a task. Cons: It is almost impossible to see everything that a team member is working on. Pros: User Controls. I like being able to control who can edit and create issues and stories and who can view only. Cons: Embedding images and videos is rough. More markdown features would be nice. Ability to tighten the style Esp. on the Kanban board. I'm an advocate of specificity, so we're verbose, by default. Its tough to see anything useful in the Kanban view. And, horizontal scrolling!?! That should never happen in a modern UI. Overall: Issue tracking, project planning, and feature planning. By far the best diagram software existing today. Pros: Not platform specific. Will work with Mac, Linux, or Windows. Can import Visio and Omnigraffle documents and icon/shape sets. The ability to generate SQL from an ERD! Cons: This is not really a dislike, but an idea.... It would be great if there was a place that had user created shape sets that we could explore and download. Overall: All the benefits of Visio and Omnigraffle, but in a better, easier to use, platform independent software. I use this software for the project management and issue tracking purposes in my company. 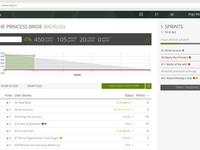 Pros: It is very user friendly and we can manage the backlog and the sprints very effectively with the kanban board . Cons: The issue tracker is very basic and it does not support for integration with other test management tools. Pros: Open source and works nicely! Perfect for personal or small projects, if you don't have a very big budget. Includes all of the expected features like team management, support for EPIC, issues, sprints and backlog (just one AFAIK). You can defined custom ticket/issue statuses. Also includes built in kaban board. Cons: Cloud version is sometimes slow after latest update . Pros: It has a very intuitive interface and is really easy to pick up for users who are unfamiliar with Agile developments. Cons: It can be more customizable such as being able to assign priorities to tasks. Storing screenshots requires storing them in a file first before uploading. It would be great if they can just be copy and pasted in. Overall: Helps me organize our development across our entire team. Pros: Clarity, ease of use and it's quite stylish too! We have found that with this tool information can be shared easily by our developers, marketing and product staff, giving them a unified view of the companies goals. Cons: I would like a better bundle deal on the licences, especially as we are a small starter company. The per head charges are "OK" but it would be great if there was a lower tier that allowed a staged uplift to the full licensing model. Overall: Clarity, Focus and a shared view of the companies goals. Pros: Easy to use, good to get started. Also I really like the fact that the software is available as open source but you can pay for a SaaS version to install it very quickly. This is what we did. Cons: Lack of advanced features. Vision / future of this software is not good for me, developers are focusing on things I find totally unrelevant instead of focusing on adding valuable features. Overall: Good software to grow the team from 5-0 developers to 30. But after that, we needed something more powerful. Pros: Firstly, the aesthetics. Secondly how well organized the progress tracking is kept by the app's online Kambam. Cons: It's not that easy to get the ropes of the app, at first the design of the app may seem not so intuitive. Overall: At this point I'm satisfied, but if the planning allows it I try to avoid Taiga.io when I can. IMHO: the best agile tool out there! Comments: It's super easy to use, introduce to a team and just super fun to work with. Go give it a try yourself! Tool allowing to jump into agile development with my team. Issue tracker, backlog, planning sprints with burnout chart. Team members are easy to manage. Tasks in backlog are easy to rearrange. Cons: The biggest problem lies on user's side: to use it in full power, one has to keep using it for longer term and it may be demanding (but it brings progress into the project). A bit strange colour scheme, a bit lost in editing issue texts. Personally I feel more in control when I edit issues in GitHub. Integration to Bitbucket repositories, commits and issues (did not dare to try if it is present at all). Overall: Simple and affordable issue and task tracking across team. User friendly project management tool. Great for smaller teams. Pros: Very easy to use. Most functionality is intuitive and does a great job of giving you visuals of each task. A better version of trello. Cons: This is a great project for smaller teams and use cases. Like Trello, when getting into much more complex setups (different teams, projects within projects, sprints etc), the feature set isn't as developed as a product like JIRA or target process. Comments: I used it with my diferents projects. I´m a musician and audio engineer, so it´s a great tool to integrate the different tasks and persons, online access and excelent UX. Highly recomended. Brilliant tool and easily customised! Pros: I love this tool, it's easy to see everything and the time feed of what's recently been changed or updated is brilliant! Cons: I really dont have any faults with this products. It might be a bug but the only things is getting rid of the customise box once you've customised. 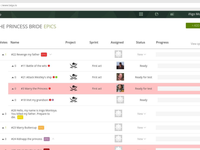 Easy to use and powerful Project management tool for getting things done. Awesomely designed tool very easy to use. Also mobile app is there again neatly designed. 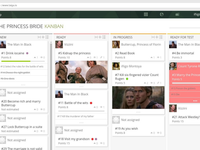 Kanban view is very good really liked it better than other tools i have seen for project management tools. Customer support is great and fast. Increased team productivity drastically and also easy to manage by manager or team lead. Cons: Less customisation options compared to other project management tools. free plan is limited to 3 users only for private projects, should be atleast 5 users. more features are there in web panel than mobile app. Android app needs to be improved. Overall: One of the best project management tools out there. Pros: I have used this software for free as its open source.I have worked on project on this software and working on this project is pretty simple and we can work easily. Overall: overall look of Taiga.io is cool and we can use for free. We've been using it to track our requirements and so far so good. Pros: It's quite easy to add/remove stories and tasks. The lists and boards are easy to glance and move around. Cons: Sometimes the web page is really slow and does not indicate it is working on something. Two persons editing the same page together sometimes result in errors. Pros: The possibility to manage the task inside my company in a fast way. Cons: It takes much time to get used to the platform since there are many features that can be used. Pros: This software is simple and down to earth. The functions that are there are easy to use and straight forward. There are plugins available but I have not researched and plugins yet. I really like the Kanban layout on the mobile app. It is clear and very easy to see what is going on. Cons: This software is simple and easy to use but I think an area for risk management would be helpful. Even a specific area set up for issue tacking would be helpful. Overall: This software has a great Kanban layout especially on the mobile app. 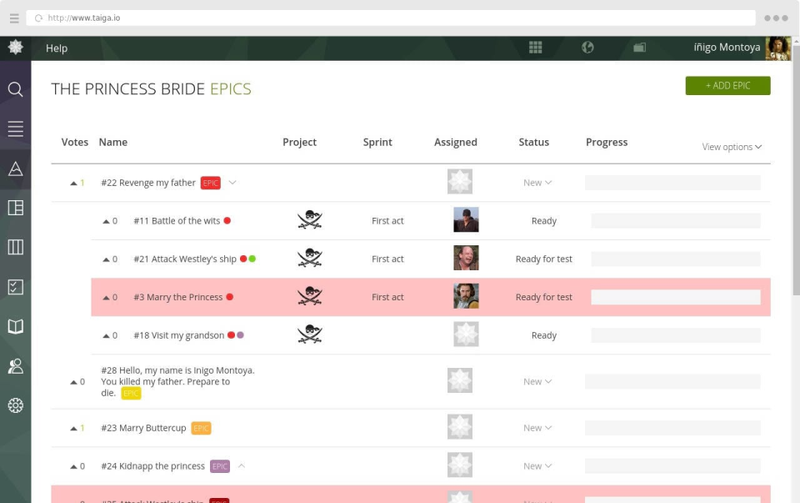 Pros: Maybe the best tool to work with agile methodologies of projects management! Agile teams love this tool because of it ease of use and all the functionalities it has! Cons: I think that there could be an obstacle if you are not familiar to agile methodologies! I really recommend this tool but you need to have knowledge in things like Scrum or Kanban. Overall: I highly recommend this software, because it has allowed me to have a better control of my activities and those of my team, using agile methodologies that allow to optimize the processes in a radical way. Cons: If your looking for advance features this software if not for you. We initially started off using Taiga and continued to use it for about 8 months and realized that it was hard to run a full scrum project using this tool.